Posted on December 08, 2016. When it comes to your home, the outside is equally as important as what is inside. Enhance the curb appeal of your home with fast fixes to makeover exterior front doors in Portland OR. An attractive, thoughtfully designed Portland window replacement or front door makeover can transform the exterior of your home into a genuine pleasure. You don't have to break the budget to enjoy walking up to the front entrance of your home. A budget-friendly shortcut includes choosing high-quality replicas of expensive materials or reusing old hardware. You can also update your entry with a bold new kick plate, door handle, knocker, and escutcheon. 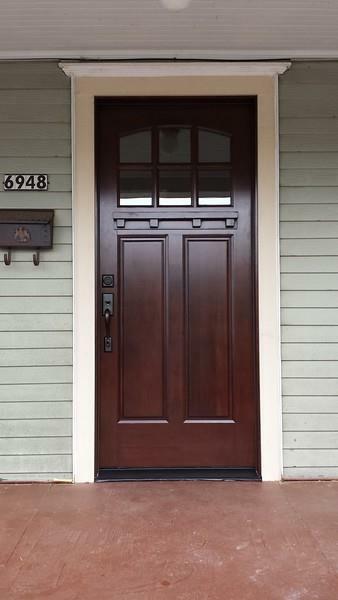 Exterior front doors in Portland OR are the most important doors of any home. Selecting the perfect one will maximize impressions and enhance curb appeal while supporting the architectural integrity of your home's aesthetics. If you are unsure which type of door suits the style of your home, comparing fiberglass, steel, and wood designs can help you make the best choice. If your painted door is showing signs of wear and tear, consider repainting it a different color. If a burst of color is your choice, include outside elements, landscaping, and house color in the decision-making process. If tone-on-tone is more your style, consider going a few shades darker or lighter than your current house color. You can also choose a neutral color such as white, gray, or black. The front door of your home makes a first impression your guests will remember and makes a statement about what to expect inside. Portland window replacement, revamping landscaping and lawns, and making over exterior front doors in Portland, OR are all essential for maintaining aesthetic appeal.Whether you want to sell or just update your home, set aside time for some attention to your front entryway.